Chrysanthemum daisy white(2 pt. ), Carnation pink(4 pt. ), Alstroemeria pink(3 pt. 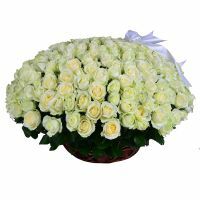 ), Rose shrub white (2 pt. ), Packing(1 pt. ), Tape(1 pt. ), Greens(1 pt.). Colleague, For grandmother, For her, Gratitude, I Miss You, Recover.